Eclectrics Sugar (White) All-Metal Blender. 2 speed dial with pulse. Large 48 oz. glass jar. Stars Based on actual user experience and reviews, this blender is RATED ABOUT AVERAGE by 22 USERS when compared to all other blenders. 80% of users rate this blender favorably. 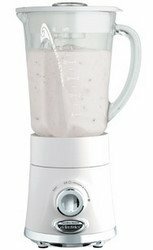 This blender looks wonderful and holds a lot of liguid, easy to clean and very sturdy. This blender is a dream. It is easy to use, with two speeds...It looks good with its designer lines. It a beautiful color, easy to clean, no leaking (yet) and hopefully the blade rotor on the underside will hold up. I like the pitcher's stability, and it is attractive enough to serve from. It is heavy, but that is the trade-off with glass. So far, I am very happy and only wish I had not waited so long. I decided on this one based on my research and I am glad I did. I make my husband fruit and juice smoothies almost every day after work and with this machine it is a fast, easy job. Ice and frozen fruit are blended into the drink very quickly.